When a baseball player begins to reach the end of his career you will frequently hear the commentator say, "He looked a step slower in making it to first base on that ground ball". Speed decreases and reaction time increases as one ages whether it is a baseball player or just us ordinary folks among the geezer population. Yesterday my wife and I took the AARP Driver Safety Program course. This was a six hour program with review and instruction intended to improve and maintain safe driving for senior and perhaps not so senior drivers. I had taken this course maybe eight years ago for the first time and even trained to be an instructor. (Must be they had plenty of instructors since they never called me for a class). Our instructor was excellent and we learned about some of the newer driving laws as well as picked up some tips to insure safer driving. This course is so good I would recommend it for everyone. One of the exercises was to determine our reaction times. I always thought I had above average reaction time. To my surprise my reaction time was only average. 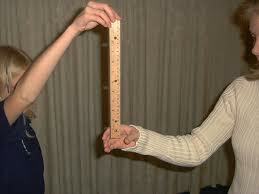 How Quick Can you Grab the Ruler? So I guess I must be at least that "one step slower" now. Perhaps I am even creeping over into the "two steps slower" category. I played some doubles tennis on this past Friday which was also a test of my reaction time. With focus, I still had pretty good reaction at the net. Perhaps this was because some of the balls were coming right at me and I didn't want to get hit. Motivation and fear can reduce your reaction time. Yes, I may be moving at a rate of two steps slower now (the coeds all pass me when I am walking briskly on the Cornell Campus). However, maybe that is alright since I get to savor the things around me. Like stopping to smell the roses, inhaling the fresh air and noticing the beauty that I missed by rushing through life before.